"March László" by Mark Wolfram is an original composition for orchestra. Written in a traditional march style, this work is dedicated to Maestro László Veres and the Tucson Pops Orchestra of Tucson, Arizona. 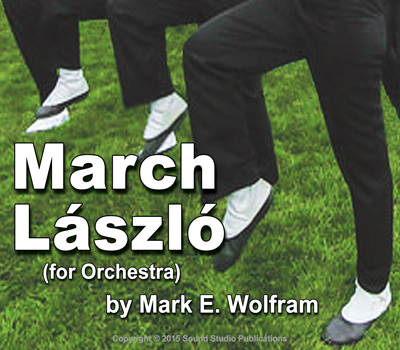 "March László" is a GRADE 4 orchestral composition which has everything a great march needs: memorable melodies, interesting counterlines and an infectious beat which will have your orchestra and your audience tapping their toes. The work has a duration of approximately 3:50. This is the perfect piece to fill that "march" slot in your program!